Top Gear: The Complete First Season Giveaway! Top Gear fans, rejoice!! 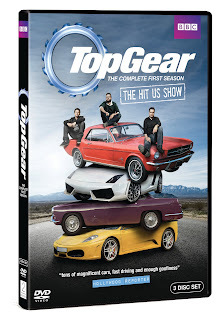 On July 19, the DVD for the first season of the U.S. version of the smash British series Top Gear was released! Thanks to BBC, I have 3 copies of this great DVD to giveaway. Top Gear races across the pond with the first season of the U.S. version of the world’s most popular car entertainment show. Coming to DVD this July, Top Gear: The Complete First Season, produced by BBC Worldwide Productions, includes all 10 episodes and exclusive DVD extras. 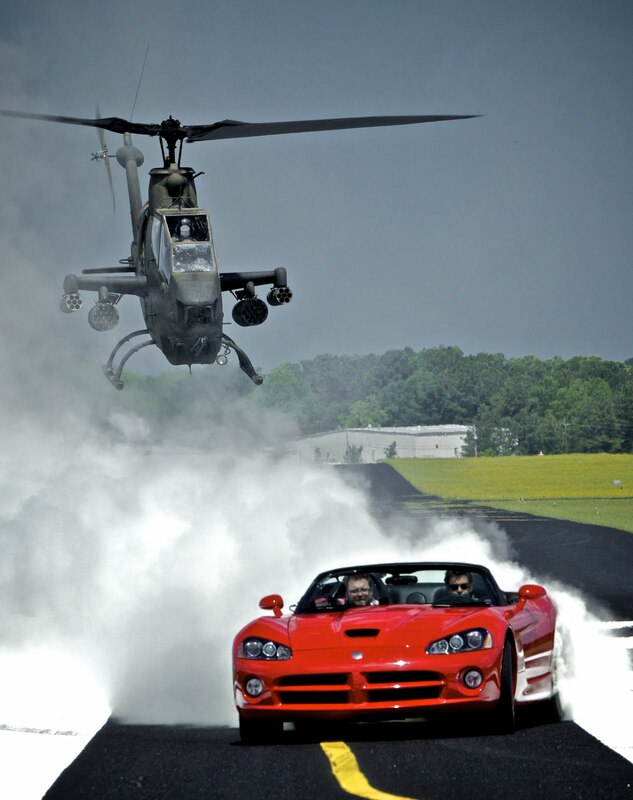 The debut 3-disc DVD set features comedian Adam Ferrara, champion rally car and drift racer Tanner Foust and racing analyst Rutledge Wood. The intrepid trio packs the first season with super-cars, extreme stunts and challenges, car reviews, celebrity interviews and, of course, the Stig, Top Gear’s silent and mysterious racing driver. The show is chock-full of high-adrenaline action entertainment as it tracks the colorful history of the automobile as well as the eccentric adventures of its hosts with Top Gear’s customary wit and humor. In this series, Ferrara, Foust and Wood take on extreme challenges including a moonshine run along a Prohibition route in the Deep South, teaching a blind man to drift a Nissan 370Z and racing a HALO jumper in a Hennessey VelociRaptor across the Arizona desert. The Stig also appears to set definitive “Power Laps” and the team tests some of the world’s fastest cars including a Dodge Viper SRT10 ACR, a Porsche Panamera Turbo, an Aston Martin V12 Vantage and more. Celebrity guests take the wheel in the “Big Star, Small Car” segment including astronaut Buzz Aldrin, actors Ty Burrell (Modern Family) and Dominic Monaghan (Lost), musician Bret Michaels and skateboarder Tony Hawk. Arriving in stores on July 19, Top Gear: The Complete First Season is fully loaded with special features including audio commentary, webisodes and more. Check out the official Top Gear site! To enter to win one of the 3 copies of this great series, just leave a comment letting me know what was your first car? That's it! Be sure to include your email address either in the comments section or your profile so that I can contact you. Open only to the U.S. The winner will be chosen on Aug. 1 by random.org and will be contacted by email for a mailing address. If I don't hear back from you within 72 hours, I'll have to choose another winner. Disclaimer: I was provided 3 copies of Top Gear: The Complete First Season by BBC for this giveaway. My first car was a Plymouth Fury. I bought it used in 1970. My first car was a 1975 Mercury Comet. My first car was a Vette...chevette. My first car was an adorable VW Beetle! My first car was a Toyota Camry! I had a 1976 Chevy Stepside pickup! It leaked oil really bad and I had to carry around a case of oil and always put more in! First car was a 1992 Subaru Justy. Mine was a 78 Ford 9 passenger station wagon. My first car was a very old Ford Fairlane. It ran for about 10 minutes! my first car was a 1986 chevy nova. man do i miss that car! I had a 1980 El Camino! It was gold in color (they called it camel, I think) and I loved that thing. No A/C, no radio, but it looked cool! A 1979 Chevy Nova and I loved it! My first vehicle was a 1982 Ford Mustang. Everyone - bow down now. My first car was a 1974 Ford Pinto. Yep - I used bondo on the door panels and floor every other week alternating to fight the rust. I win 'best ride' and should definitely get one of these DVD sets. I know you're jealous - deal with it. My first car was a Chevy Cavalier. My first was a Pontiac Sunbird! mine was any old Ford station wagon. My first was a 1981 Ford Ranger! I loved it. My first (and only) car was/is a Dodge Intrepid. Mine was a Kia Sportage, thanks! My first car was a cougar convertible. I got it when I was 16. My awesome oldsmobile cutlass supreme...lol!! first car was family 70's station wagon. My first was a pontiac.